Tin Zinc Plating was originally developed in the 1940s. Over the years, it has maintained an important niche in the metal finishing market due to its unique properties. Tin Zinc Plating produces an alloy containing 65-85% tin with the balance being zinc. The deposit is ductile and maintains good solderability after aging. The tin in the deposit behaves as a barrier coating while the zinc delays corrosion further by working galvanically to protect the base metal. Corrosion protection can be enhanced through the use of a chromate finish. Chromate finishes are currently available in clear or yellow. Tin Zinc Plating can be safely applied to sensitive electronic components and glass to metal seats, with no attack to the glass. It provides great protection on steel componentss that come in contact with aluminum. 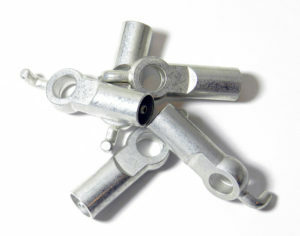 Tin Zinc Coatings will maintain their corrosion resistant properties even after hard crimping and bending. They also provide exceptional performance when exposed to salt water and sulfur dioxide. Examples: brake fittings, cooling pipes, transmission fittings, mounting brackets, nuts, bolts, rivets.